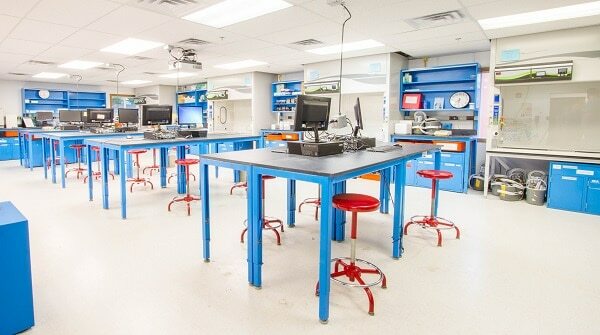 In the first half of 2018, one of Triumph’s largest projects was building an entire temporary science center for Wellesley College. As Wellesley renovated their permanent science center, they wanted a temporary one students could use for 3 years. Triumph achieved this goal in just 6 months: we started in December 2017 and finished in June 2018. Thus, by the time the Fall 2018 semester started, the building was ready for occupancy. Help Wellesley College attract top students. Provide an environment where scientific research can thrive. The outcome of the research dictates whether faculty tenure. Meet guidelines for Lab Biosafety Level 2. BSL-2 refers to spaces that exhibit specific controls for the containment of microbes & biological agents. Create a new working environment for faculty. The college chose to use modular delivery based on comparing modular vs teaching spaces at nearby universities. Wellesley determined that students experience better outcomes via a temporary modular building rather than going to a nearby university to learn.